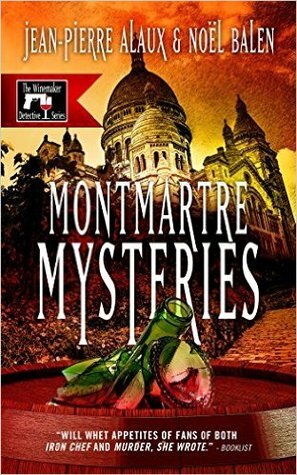 Wine expert Benjamin Cooker travels to the French capital, where his is called to help care for some vineyards in Montmartre, a neighborhood full of memories for him. He stops in on an old friend. Arthur Solacroup left the Foreign Legion to open a wine shop good enough to be in the Cooker Guide. But an attempted murder brings the past back into the present. But which past? The winemaker detective and his assistant Virgile want to know more, and their investigation leads them from the the sands of Djibouti to the vineyards of Côte du Rhône. As an expert in French wines, you’re familiar with our country’s vineyards, both large and small. That includes, of course, the well-known vineyard in Montmartre. But did you know that Paris has other grapevines? I am not talking about a few climbing vines or espaliered stocks against the walls of a forgotten garden, but a true plot of them, which chance has made me, if not its owner, at least its representative by proxy.It so happens, Mr. Cooker, that a few months ago I was appointed to run the Bretonneau Hospital in the eighteenth arrondissement. This old and beautifully restored establishment was once a children’s hospital. In 2001, it became a hospital for the elderly with 205 beds. Our patients, despite their white hair and unsteady gait, have eyes that light up when they toddle like children down the rows of this vineyard, picking the chasselas grapes. Unfortunately, this minuscule vineyard is now old, like the patients who love it, and each year the harvest grows more uncertain.Our table grapes suffer from lack of proper care, and many of them seem to be rotting on the vine. It is therefore in desperation that I call a vine doctor to our bedside. In all of France, is there a better choice than you?I do not know if your busy schedule allows you to take a look at what is certainly the smallest vineyard in France (barely one hundred plants) and hopefully prescribe a cure, but your knowledge would be very precious to us. Unfortunately, I do not have the funds in my modest budget to pay your fee. Could I simply call upon your benevolence and skill?On behalf of all of our patients, I thank you in advance and hope to count you among the healthy visitors to Bretonneau Hospital, whose entrance is on the Rue Joseph de Maistre.Yours sincerely,The name in the signature was perfectly legible, but the unusual letter was on plain paper, not stationery from the Paris Hospital system. Benjamin asked Jacqueline to call and verify that the author was, indeed, an employee of the institution. This is the 8th book in the Winemaker Detective series but I think it can be read as a stand alone. There are quite a few ways the story could have gone so you’re guessing and changing your mind throughout the book. It’s a short read and there are no lulls in the story, and all the characters are interesting. I’ve only read a few in this series but wouldn’t mind going back and starting from the beginning. 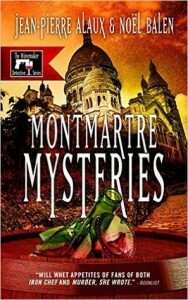 I love mysteries, and one of the biggest draws for me was that the book takes place in Paris. A very good book if you like mysteries and/or Paris. Jean-Pierre Alaux and NoÎl Balen, wine lover and music lover respectively, came up with the idea for the Winemaker Detective series while sharing a meal, with a bottle of Ch‚teau Gaudou 1996, a red wine from Cahors with smooth tannins and a balanced nose. The book was translated into English by Sally Pane who studied French at State University of New York Oswego and the Sorbonne before receiving her Masters Degree in French Literature from the University of Colorado. She has translated several titles in this series. Vicki, thank you for hosting this fabulous giveaway! I’ve read an earlier book in the series and really enjoyed it. Like you I’d love to go back to the beginning and read them all. Thanks for hosting the giveaway! This sounds like a great series and it’s on my list to read. I love anything to do with wine (well maybe not my job every day) so I think this would be right up my alley! I’ve read a few of the Winemaker Detective series, but not this one, yet!